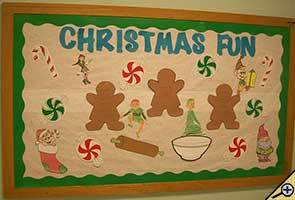 Our December Bulletin Board Ideas page will provide you with great resources for a number of monthly events, holidays and themes. 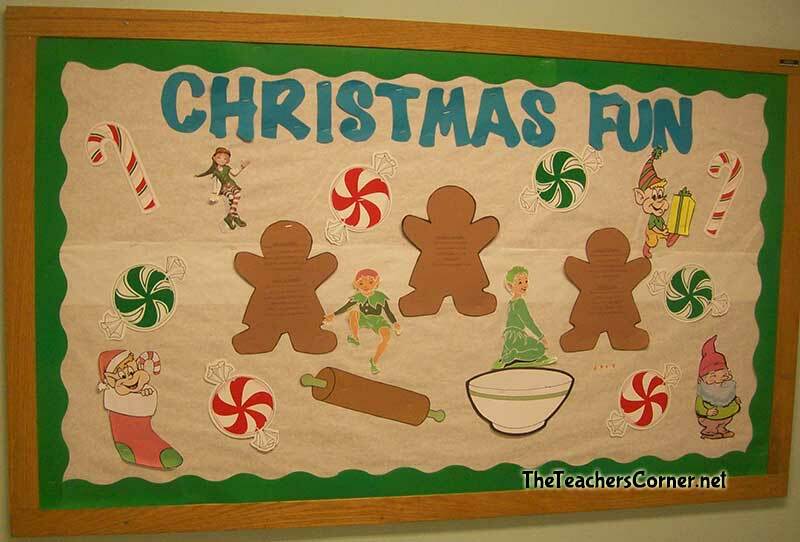 Our bulletin boards will help you integrate seasonal activities into your daily curriculum. Ideas within the December bulletin board pages include resources for the following: Christmas, Hanukkah, Kwanzaa, gifts, snow, and New Year. This bulletin board can be as simple or as involved as you would like. Use it as a simple art project or part of a complete gingerbread unit. Provide students with a copy of the pattern below on brown construction paper. Using other colors of paper and/or decorative items, they can decorate their gingerbread men. This is a fun holiday activity for book buddies. Each student traces and cuts out their handprint on green construction paper. On the hands, students write why they enjoy reading with their younger/older book buddy. Attach the hands to a piece of white butcher paper in the shape of a wreath. Attach a bow. Print a picture of Santa. Attach a piece of lined paper that is cut into the shape of his beard. 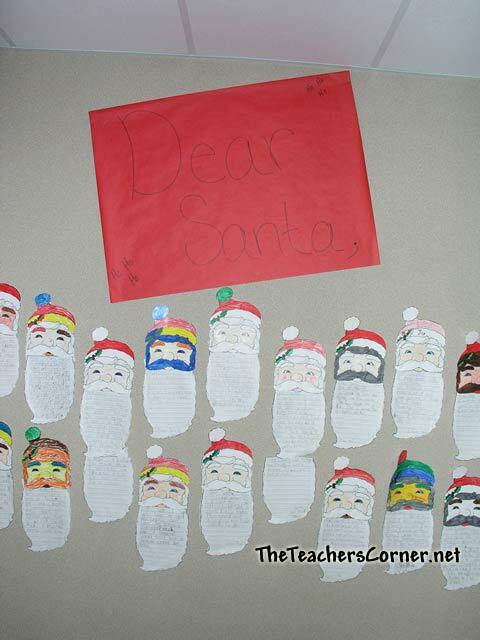 Students can then write their letters to Santa. Each student traces and cuts out their handprint on green construction paper. Attach the hands to a surface visible to parents in the shape of a tree. On round, colored ornaments, write the names of items that parents may purchase and give to your classroom. Each year I provide each child with a red felt stocking decorated only with their name. The children take art time to glue green felt trees, sequins, snowflakes, and other tiny decorations on the front of their stockings. During the month of December as the days get exciting and busy, good work and good behavior is encouraged by the use of the stockings. Treats such as pencils, candy, small toys, and stickers are added at the end of the school day for those students that have had good work and good behavior. Each morning as the children enter the room they look to see how "fat" their stocking has gotten. The caption across the bulletin board reads "Good Behavior and Good Work Help to Fill Our Stockings". When the children leave school for the Christmas holidays the filled stockings are given to each child as a special gift to take home and enjoy. It is amazing how hard the children work and how good the behavior is during the month of December! Also, it is amazing how many children continue to save this special stocking in the years to come. I wrap styrofoam squares with wrapping paper (various sizes) and put a bow on it. I label my bulletin board "Gifts From the Heart". i have kids think of things we cant buy for people but can give..... (a smile, a prayer, happiness, kindness) you will be amazed at what they think of. 1. Use light/neon blue background paper and put snowflakes at the corners and around (but not too close to the one at the corner) the edge of the board.Put silver tinsel instead of a border around the board. 2. Trace each child's hand on green paper and put green glitter around the hands once you have cut them out. 3. Make a yellow star and brown stump with corresponding colors of glitter and put the tree together on the left side of the board. 4. Find SMALL candy cane cutouts and write the children's names on them (as many as you can fit on the tree without gobbing it up) with a black sharpie. Stick these on the tree. On the right side use black block letters (lollipop style work good too) and put helping as the top word, Christmas as the middle and hands as the bottom. Use all capital letters except if you are using the lollipop (then use capital for the first letter of each word and lowercase for the rest. 5. Make three colorful tissue paper presents with tissue and curling ribbon (small ones) and find small Christmas tags and write children's names on them (not the children in your class, just common children's names like Jane, Michael, etc). and stick these below the tree but not around it. 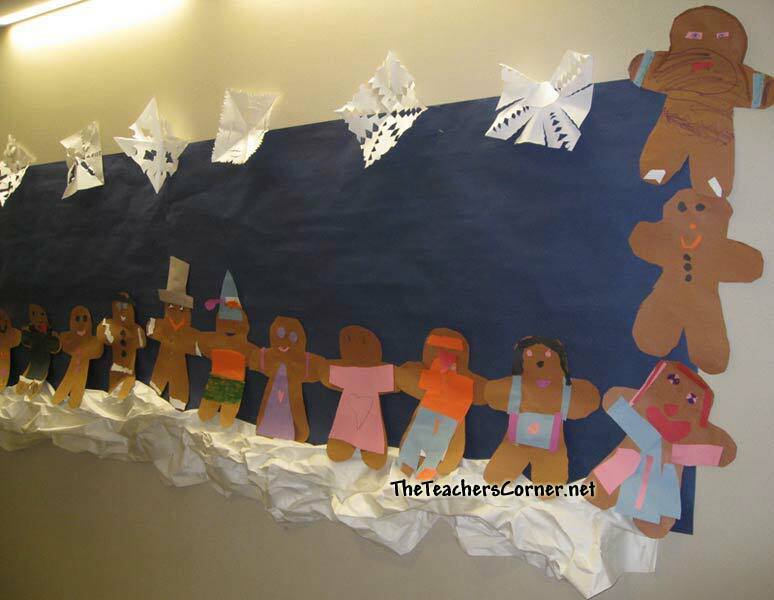 Winter Bulletin Boards - Find winter themed bulletin boards: Snowmen, snowballs and more. 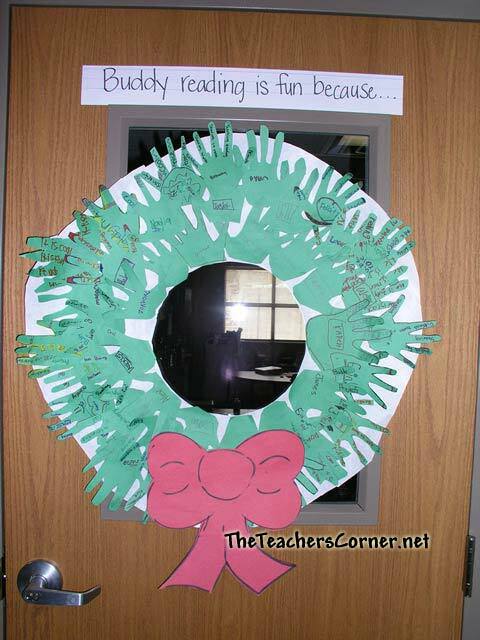 Wrap your classroom door like a great, big Christmas Present! I make a tree and spray it with that white snow spray. Then I wrap pieces of cardboard and staple them to the board under the tree. The children's work is then neatly arranged on the board. A great way for students to "shop" for each other during the holiday season. 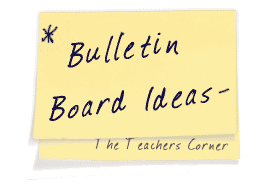 Please EMAIL your favorite December Bulletin Board idea.